So I finally have gotten around to writing a review of my new Samsung Omnia. I’ll skip the basic design and specifications and point you to my Samsung Omnia Overview post to give you a look at the specifications and what to expect. I’m a bit torn on the Samsung Omnia’s design. While I hated the fact that it looks more like an iPhone copy, I’m glad that the Samsung Omnia is less wide than the iPhone. This makes the Omnia perfect for handling with one hand. You could scroll through menus and write messages with just one hand so I guess that’s on the plus side. Another thing I hate about the design is that though the Samsung Omnia has an expansion slot, Samsung had to place it at the back of the battery cover and you have to remove the batteries before you could actually insert your microSD card. I also would have preferred the optical center button to be a four-way directional button since like I have said before on my Samsung Omnia Overview, when you have a touch screen phone, there’s really no need for a finger mouse. Also, I would have hoped that they found a way to hide their stylus discreetly unto the phone than just letting it hang like a keychain of some sort. 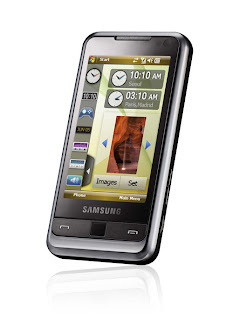 The Samsung Omnia is not an iPhone killer if you’re going to base it on the user interface. The iPhone is still number one when it comes to fluidity of touch screen controls. While I love the Samsung Omnia’s widgets, there’s still some noticeable lags and occasional jumps when finger scrolling the programs or your contact lists. Samsung’s TouchWiz interface doesn’t clash with Windows Mobile Interface, in fact, Samsung did a pretty good job hiding the problematic Windows Mobile Interface. They made sure that buttons are large enough so you won’t have to use or would rarely use the included stylus. The haptic feedback is good though the ROM version with my Omnia doesn’t support haptic feedback on the messaging keyboard. I have to update my ROM in order to have this feature. Compared with the HTC Touch Diamond, I like the Samsung Omnia’s interface better as it is simpler and more responsive. The Diamond’s interface has just way to many graphics and sometimes sluggish for me to enjoy. Of course, a lot of people have their own preferences and some might actually enjoy the Diamond’s interface more. One of the things I hate about Windows Mobile devices is that almost all Winmo devices I have owned have a tendency to hang. I don’t know how Samsung did it but in my more than 1 week use of the Omnia, it has always been on and yet, I never experienced the device soft resetting (except when installing applications that needs restart) or hanging in any way. It may be because I never forget to close all open applications using Samsung’s taskbar or maybe the applications on the Omnia just have less memory footprint. Battery life is the best I’ve seen on any windows mobile device. Though whenever I use the internet extensively for one hour together with Bluetooth, the Samsung Omnia only lasts me around 12-18 hours of use. However, when I skip the Internet or minimize my use to about 15 to 20 minutes and use less Bluetooth, I got almost two days of use out of the device! Pretty awesome. The built-in accelerometer on the Samsung Omnia is not as responsive as the iPhone but you can set the sensitivity settings. You can also choose the animation when changing from landscape to portrait mode. I have never been an audiophile. That’s what I always say on my reviews. However, I have heard music on the iPhone and I know that I’m hearing good quality sounds spewing out of this device. The Samsung Omnia performs really well when it comes to music. I’ve streamed music using my stereo Bluetooth headset and the sound is amazing. Hey, I may not be able to compare which is better between it or the iPhone when it comes to music but I know that the Omnia could at least compete with the iPhone when it comes to its music playing capabilities. The Samsung Omnia also has a built-in Radio with RDS. You could actually record a song on the radio, record quality is a bit noisy but understandable considering you’re recording an FM station. The Samsung Omnia is Divx ready which means you can play divx encoded videos straight from your PC without the need to convert it. When it comes to video playback, the Omnia is not in league with the iPhone’s crisp display but videos are watchable plus, I think the fact that you’re not burdened with converting divx videos would make the Samsung Omnia appeal more to lazy folks like me. I have to admit, though the haptic feedback is good on the Omnia, it doesn’t make typing on it easier. You’re still prone to pressing the wrong keys. I found that using the Samsung QWERTY keyboard in landscape mode makes typing a little bit easier for me. I think this is a windows mobile 6 update but in the SMS messaging section, messages from the same sender is compressed in one file or “conversation”. SMS addicts who’re fond of forwarding and saving SMS quotes or funny messages would find this a pain as you can’t choose which messages you can save from a particular sender, since when you delete a message, EVERY message from that sender is deleted. I think this is called “threaded” messaging. Calls are clear on the Samsung Omnia and speakerphone option is actually good, actually better than the iPhone. The Samsung Omnia offers an array of connectivity options. You have 3G/HSDPA, Edge, GPRS, Bluetooth, WiFi, TV-Out, USB connection, and GPS. The Samsung Omnia actually gets pretty good signal compared with my Samsung i780 when indoors. I haven’t tested the TV-Out option since I didn’t buy a separate TV-out cable. My only gripe is that Samsung had to use their proprietary port for USB and headset connection. Though you can insert a 3.5mm headphone jack, you have to insert it using a Samsung adapter and not unto the phone itself. I have to use MapKing for my GPS software and therefore use a port splitter. GPS signal is good but I have to wait around 3 to 5 minutes before I can be located. The web browser on the Samsung Omnia is the Opera Browser 9.5. I have managed to compare the Safari Browser and the Opera Browser and I hate to admit it but the Safari Browser still has a good interface, thanks to the iPhone’s multi touch feature. Scrolling through the Opera Browser can be a bit of a pain as the browser jumps or sometimes scrolls too fast that you missed the section that you want to read. You can zoom in and out of a page on the Opera Browser by pressing and sliding your finger up and down the right side of the screen. The Opera Browser wins points when it comes to download times as it shows a web page faster than the Safari browser but the Safari buffers a page more smoothly compared with the Opera. But aside from that, browsing the internet on the Samsung Omnia could actually be fun and easy. Maybe future updates on the Opera Browser or a better browser could finally kick the Safari Browser off the top position when it comes to mobile web browsing. Since this is a windows mobile device, it comes standard with Pocket Outlook, Pocket Word, Excel, and a PowerPoint Viewer. Samsung also included a PDF reader on this device so a business man has everything he needs to edit his documents on the go. Since the Samsung Omnia has a TV-Out function, you can actually just plug this in a projector and show off your presentation without lugging around a heavy laptop. Email inbox supports IMAP, POP3, and Push Email. You can also store an unlimited number of contacts, appointments, addresses, etc. I’ve saved the best feature for last. When buying a windows mobile device, I actually gave up on the camera on my third or fourth Winmo. I was resigned to the fact that there’s never going to be a g windows mobile device with a good camera—until the Samsung Omnia. While I admit that I’m not an audiophile, I have to say that I can be a pretty good judge when it comes to visuals and the camera on the Samsung Omnia is G-R-E-A-T! It has autofocus, smile detection, face detection, auto image stabilization, loads of scene selection, macro mode, and a LED flash which is actually useful. There’s also a business card reader function wherein you take a picture of a business card and the Samsung Omnia automatically saves the name and number on the business card. Tried out this feature and it works good though I actually have to take a picture of the business card twice before the Omnia was able to read and save it. The smile and face detection can take a while before it snaps the picture of the person but image quality is really amazing. Samsung did a pretty good job on the camera of this phone. There are a few devices on the market that can claim to do EVERYTHING. Mobile phones can usually be categorized into a camera phone, business phone, music phone, fashion phone, and while one or two features may be present, there’s no one device that can claim it mastered every feature. Nokia likes to call their N95 a “multimedia device” but too few can actually call it a business phone. The iPhone claims to be a smart phone but some people beg to differ because it lacks certain business applications plus the fact that with its phone features it can hardly be called a “phone”. Some windows mobile devices can claim they’re an all-in-one device but I could aptly call previous windows mobile devices as, “a jack of all trades but master of none”. Now the Samsung Omnia—well, aside from the fact that it lacks a physical keyboard (I actually bought a bluetooth keyboard compatible with it), I could truly say that this is one device that actually offers, EVERYTHING. Thanks for your review. I was torn between the iphone, which is very popular, but not supported in the UAE and the Omnia. After reading your post along with other reviews, I felt comfortable going for Samsung. Thank you for your in-depth review.. I have asked on many occasions on other sites for reviews but yours has definately helped me... now I'm to get my Omnia! Cheers! Your welcome, anonymous, hope you enjoy your Omnia. And if you ever need help, the guys over at Modaco.com are really helpful. They have a dedicated Omnia thread which is really useful. @ amber hmeid, the Bluetooth keyboard I use is just a generic china made one which is a pain since I had to Google for hours until I found an updated driver for it. It's best that you just go with a Belkin Bluetooth keyboard since their drivers are updated to support windows mobile 6. The Samsung Omnia is a dreadful phone. Battery lasts <4 hours, it crashes repeatedly, phone quality is poor and I have replaced it after 1 week and 1 day. I wrote to Samsung and received no reply. Perhaps only to be expected. Please do yourself a favour. Do not buy the Omnia. Its a dreadful phone with no support. The software is not touch friendly, it shuts down too often. This is after I have done a hard reset on it twice with the hopes to solve the problem. The phone hangs while sitting idle so all my calls get diverted to answer phone. I am waiting for the next HTC device with android and buying that. After the last round of ROM updates, this is the best phone on the market by far. All the problems mentioned, I can say that I have has not one lock up and with the availble ROMS out, this is more than just a phone, it is my new best friend! ROCK ON Samsung! PS Folks... Buy the extended battery! 8 hours of solid internet radio! AWSOME!!! !